Argo-E is excited to announce the development and launch of GeoWorld new mobile app for Android mobile devices! 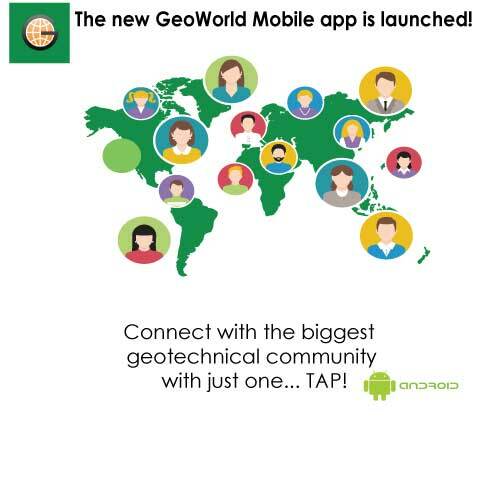 The mobile app is free to download and offers the best of GeoWorld experience enabling you to connect with the biggest geotechnical community with just one TAP! The app is continuously updated by Argo-E.
GeoWorld is an International Professional Network for Geoengineering created jointly with ISSMGE. It’s a free online platform functioning as a mean of communication for geoengineers and associated fields. We are really excited about the new platform, which is just another step in the growth of this community, which has more than 8500 members and already includes 600+ companies and organizations. ARGO-E will also continue to support the GeoWorld new app , so that it remains up to date! Argo-E provides services on information technology in Civil, Environmental and Construction industry. Our Portfolio can be found here.